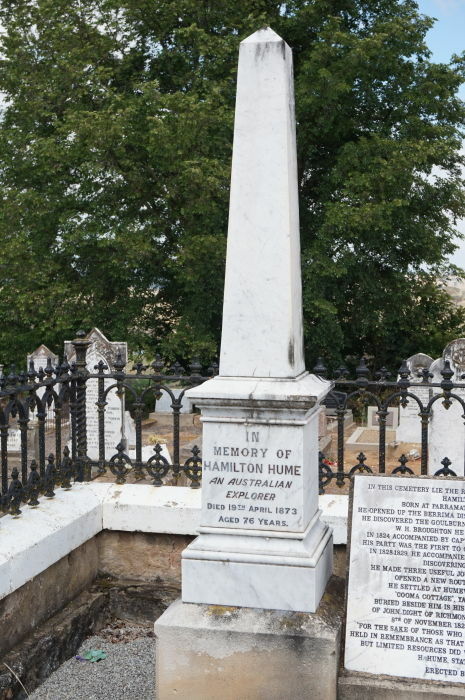 A headstone at the gravesite commemorates explorer Hamilton Hume. A marble plaque has also been erected at the site giving details of Hume's explorations. Hamilton Hume (1797 – 1873) was an early explorer of New South Wales and Victoria. In 1824, along with William Hovell, Hume participated in an expedition that first took an overland route from Sydney to Port Phillip (near the site of present-day Melbourne). Along with Sturt in 1828, he was part of an expedition of the first Europeans to discover the Darling River. On 17 October 1824, a fortnight after leaving Hume`s home at Appin, the party left his station at Gunning, then the farthest out. In the next sixteen weeks the party made many important discoveries including the Murray River, which the explorers for different reasons named the Hume, many of its tributaries, and the valuable agricultural and grazing lands between Gunning and Corio Bay in Victoria. It was a rich return for the distance travelled. They arrived back at Gunning on 18 January 1825. For his services Hume received a grant of 1200 acres (486 ha), which he was forced to sell to pay outstanding expenses. In 1839 he bought from Henry and Cornelius O`Brien a cottage and 100 acres (40 ha) on the Yass River and lived there. In 1860 Hamilton Hume was elected a fellow of the Royal Geographical Society. He became a magistrate and attended to his duties in Yass almost to the day of his death. An Anglican, he was a foundation trustee of St Clement`s, Yass, and other institutions in the township. Yass, Friday.- Some time ago a public meeting of the residents of Yass was held, with a view of having a monument erected to the memory of the Australian explorer, Hamilton Hume, and the Government was approached to assist in defraying the cost. A letter has now been received from the Attorney General's Office, stating that, as a monument had already been erected to the memory of the late Hamilton Hume at Albury, the Government did not feel disposed to grant money for another at Yass; but, as the explorer's grave was at Yass, the Premier was agreeable to find money for a suitable headstone in the cemetery there provided the opinion of the people of Yass was obtained and a decision as to how far they would assist the Government in contributions. The matter is to be discussed at the next public meeting. Goulburn Evening Penny Post (NSW), 20 June 1908. In This Cemetery Lies The Remains Of The Explorer Hamilton Hume F.R.C.S. Born At Parramatta On 17 June 1797. He Opened Up The Berrima District In 1814. In 1818 With Jas. Meehan He Discovered The Goulburn Plains. In 1821 With Geo Barber And W H Broughton He Discovered The Yass Plains. In 1824 Accompanied By Capt Hovell And Six Assigned Servants, His Party Was The First To Overland To Port Phillip And Return. He Made Three Useful Journeys Down The South Coast And Opened A New Route Over The Blue Mountains. 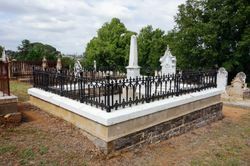 He Settled At Humewood Yass In 1830 And Died At "Cooma Cottage" Yass On 19 April 1873. Buried Beside Him Is His Wife Elizabeth, Second Daughter Of John Dight Of Richmond NSW Whom He Married On The 8 November 1825. There Were No Children. But Limited Resources Did What He Could For His Native Land". H Hume Statement Of Facts 1873.